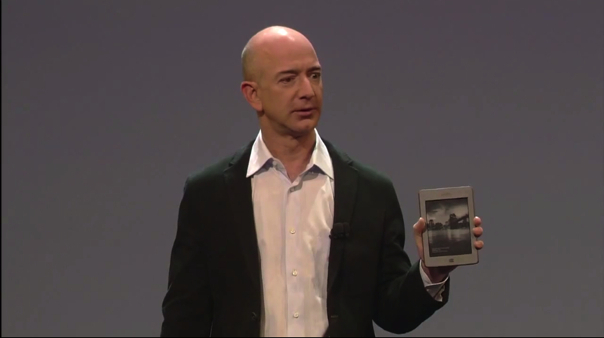 Did you read the reviews of Kindle Fire, the new tablet from Amazon(s amzn) being sold for $199? If not, let me sum them up for you: mediocre to less than mediocre, although our own Kevin Tofel seems to like it. My experience with the Kindle Fire has been less than stellar, but honestly, I’m an iPad(s aapl) guy, so the comparison is always going to be unfair. My review of Fire was going to mirror some of the widely circulated sentiments from experts such as Walt Mossberg, so I decided to skip it for now and spend some time with the device before I have my final say. Instead, I’m focusing on the other new Kindle: the Kindle Touch. From the minute I held it in my hands and turned it on, only one thought ran through my mind: It’s the best Kindle yet. The Kindle Touch is fast, extremely light, easy to hold, sensitive to touch and more importantly, easy on the eyes. Kindle Touch works because it’s simple and singular in purpose. There’s no clutter. Gone are the unnecessary buttons I never used. The reading experience is exactly what you would expect from Kindle: clean with little or no strain on the eyes, thanks to the e-Ink screen. Like every device I get to review, I ignore the instructions and try to see how intuitive the device is. Kindle Touch gets 8.5 out of 10 for its intuitiveness. I tried to navigate pages back and forth with one hand and encountered no problems. I even used the swipe gesture I learned on iPhone and iPad and moved the content back and forth. The only thing I had to learn and remember: I had to touch the top of the screen in order to bring up the menu and the Kindle store. In short, it’s a delight. Just as the original iPod made other MP3 players look decidedly dowdy, the Kindle Touch makes its older self look sad. The analogy that comes to mind is of a nerdy teenager who turns into a heart-throb in his twenties. Not only that — the Kindle Touch is a lot cheaper compared to the $400 we paid for the original Kindle four years ago. I praise the device with just one caveat: These are my first impressions. I’ve only had a few hours with it and have read only five chapters of The Information so far. My final opinions will come after a week, but sometimes, first impressions are the right ones. Got my Kindle Touch two days ago, and I love it. The keyboard and menu are a big improvement over Kindle 3. My only problem has been highlighting text that continues from one page to the next. I got my Kindle Touch two days ago, and it’s great. The keyboard and menu are a big improvement. The only problem I’ve had is highlighting text that continues from page to the next. Maybe Iâ€™m just getting old? The new nook app for Kindle is brilliant – you can get all the Android apps free now! We got the nook app download instructions from http://www.kindlemad.com through google. I love my new Kindle! I think that 6″ is the perfect size for a mobile tablet. Its a mini step up from the new Note e.g. If only they made a real tablet with that kind of screen, though with smaller bezel that would take it less than 4″ wide. Looks an awful lot like my BN nook. The first generation, from two years ago. Just sent back the Kindle Fire. It felt terrible in the hand, the screen was too small for its weight, navigating the carousel was too awkward and it didn’t support Exchange. Fire has some nice touches, though. The UI is simpler than stock Android. Prime video integration is great. Amazon’s app market feels much better than Google’s, and the addition process is easier. After iPad, though, you do feel something is missing. Based on Om’s comments I think I’ll try a Touch. I’m also awaiting my Kindle Touch (only ordered it on Monday) but I’m glad to hear the thoughts are positive so far. I’ve missed having my Kindle and have been reduced to reading via the Kindle app on my iPhone or iPad. But I miss the device itself! so, here is the key test: can I turn the pages of the Kindle touch wearing my leather gloves while I’m waiting outside for bus, tram etc? Probably not important in California :) but a necessity in Amsterdam in November! Not unless you have fingerless gloves or the kind with tips that work with capacitive screens. ;) Stay warm! Buy a Nook Simple Touch instead. B&N left the page turn buttons, a swell as adding swiping and hot spots for touch use. Glad to hear the initial thoughts are positive! I’m anxiously awaiting my Kindle Touch, so hopefully it ships soon!